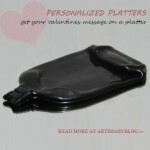 This is our first personalized product in a series of personal products that we have in plan. We are quite excited about this product to be launched for Valentines. Your message will be there for a long time to cherish….